Editor’s Note: The following essay by one “Isaac Bickerstaff” (a likely pseudonym) found it’s way to me last week and though you will no doubt find the author’s viewpoint repugnant, manner pompous and conclusions horrific, there is value in the connections Bickerstaff makes. All comments to the author can be left here and I will make sure that they are made available to him. –R.C. It can be. And yes, I do. “My god!” gasped my devoutly atheist dining companion. “How sickening! And you approve of this practice?” To which I retorted, “I thought you vegans liked ‘foe’ meat.” Ha Ha. Well, that, as they say, was that. Quicker than you could shout, “Zombie Apocalypse!” my erstwhile friend bolted up from her chair, threw a crumpled twenty-dollar bill onto the table and left in a proverbial snit. A vegan snit, the kind that eschews rational discourse in favor of emotional outbursts. Ah well. Had she stayed, I would have made the case for cannibalism delineated below. Given that you have arrived this far, dear reader, you will, no doubt, do me the courtesy of considering this, sans snit, on its own merits. Before we launch into the, ahem, meat of the matter let me hasten to clarify: I am in no way advocating for acts of murder such as those committed by the likes of Albert Fish or Jeffrey Dahmer. To equate all incidents of human flesh consumption with the depravity of such psychologically twisted individuals is just the sort of hysterical thinking which is antithetical to understanding and rationality. What I am hoping for is that I will be able to persuade you to acknowledge, firstly, that cannibalism is not, a priori, inconceivably abnormal, unnatural and wrong. In support of this, I wish to show that the eating of the recently deceased in certain situations has proved necessary for survival. So-called cannibalism has also been the norm in numerous cultures around the world as it is amongst the aforementioned Korowai. Secondly, I intend to open your eyes to the benefits of including humanely harvested, healthy human-based protein in your diet. Lastly, I’d like to offer a modest proposal for obtaining a steady supply of such meat which I humbly submit could very well offer a creative solution to pressing societal problems. There are a number of historical incidences of necrocannibalism (eating the corpse of someone who is already dead) as an extraordinary means of survival. People who have been shipwrecked, stranded or victims of famine have, as a last resort, engaged in this practice. One of the most famous examples is that of the Donner party in the winter of 1846-1847. Here we have pioneers on their way to California trapped in the Sierra Nevada with no other means of sustenance than the consumption of the flesh of those who had recently died due to the privations of their desperate situation. Though many might find such actions disgusting and transgressing a societal taboo, who but the most callous would condemn the survivors for merely trying to stay alive by consuming inanimate human flesh? The fact that a number of those who did so were haunted for the rest of their lives by their actions speaks to a tragic internalization of shame foisted by society on those who veer from acceptable food choices. 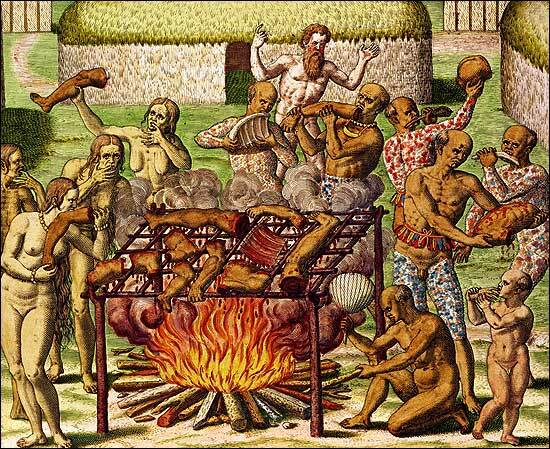 Cannibalism has been well documented throughout the world; the Amazon Basin, Congo, Fiji, Melanesia, New Guinea, New Hebrides, New Zealand among other places have all historically been home to people who have, as a part of their culture, at one time or another consumed the flesh of other people. The Leopard Society cannibals were active in West Africa, particularly Sierra Leon, Liberia and Côte d’Ivoire, in the mid-1900’s. In the 1980’s ritualized cannibal feasts among participants in Liberia’s internecine strife were documented. Who are we to decry a certain culture’s rituals and way of life? Just because we might prefer a leg of lamb to a leg of man, that does not give us the right to impose our preferences on others. Seriously, how would you like it if a cannibal exclaimed, “You eat the meat of a baby cow and drink the milk that was meant for him? How gross! Shame on you! “ Oh wait, those pesky vegans already do that! What it boils down to is, if you have no taste for human flesh, for goodness sake don’t eat it. Nobody is forcing you to engage in anthropophagy if you find the very thought of it repulsive. To each, his own. But consider this: many who have tried it, such as myself, have come to appreciate the cannibal experience as a wonderful culinary adventure. And those folks in other parts of the world who regularly partake in the eating of cadaver meat, such as the Aghoris, ascetics of India, claim that it confers spiritual and physical benefits and helps to prevent aging. I have just learned, as well, that a study, not yet published, has caused researchers to speculate that a certain protein found only in human flesh might possibly prove to be a sort of super-food which may be crucial for superior cognitive functioning, cell repair, enhanced athletic performance and as a treatment for erectile dysfunction (ED). Exciting news, indeed! Given its deeply ingrained taboo nature in our society, human meat may never be more than a specialty market. But there will always be those who are able to move beyond old prejudices and embrace the many benefits to be found in the consumption of this nutritious food. Surely you must see how wrong it would be to restrict their choices. Shouldn’t we strive to offer as many options as possible? Shouldn’t cannibals have a place at the table alongside the rest of us (yes, even those darn vegetarians and vegans)? Though I don’t suppose we will have a Mrs. Lovett’s Meat Pie Shop in every city any time soon, it is not outside the realm of possibility that a mass market will one day develop. 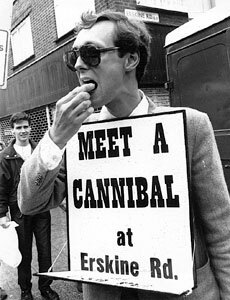 Maybe through word of mouth, social media and widespread advertising, cannibalism will lose its stigma and an anthropophagous diet will be widely adopted. So how indeed should we go about catering to cannibalism? We don’t need a Sweeney Todd to dispatch our meat in his “tonsorial parlor,” his trusty razor slashing the throats of “gentlemen who never thereafter were heard from again” but we do need to come up with some creative solutions. I would like to offer my own, if I may, within the contexts of the pressing social problems of our day. This land of ours, this generous country, is teeming with the poor: immigrants, the homeless, the wretched refuse of foreign shores, as well as our home-grown huddled masses yearning everywhere you look. One estimate puts the current number of illegal immigrants living in our country at around 30 million! And if that’s not bad enough, they continue to breed at an alarming rate. All sorts of well-meaning people have offered all sorts of unworkable solutions, from walls to welfare. I say, let them come. Let them breed. And let us eat them. Now, before I’m publicly pilloried, or excoriated on Twitter and Facebook, consider for a minute that these are not happy souls; to be quite blunt, many would be better off dead. I’m not saying to do away with them all, heaven forbid. It is their progeny I am most concerned with. And as to the continued production of choice offspring which would benefit from some sort of informed husbandry, we need look no further than non-human animal agriculture. Here we have a model of feeding operations designed for maximized production at minimal cost, We learn from such operations, for instance, that immediately after weaning, it is best to separate the young from its mother as she is likely to do it harm (I might add here that if the human mother is still lactating, her milk should not go to waste and can be a delicious substitute for cow’s milk). And so it would be incumbent upon us to remove the children of the poor and house them in facilities which will provide them shelter and protection. It would be in their best interests to do so, don’t you agree? There we can quickly fatten them up; some might be ready for harvesting at less than a year old while others may take more time to mature and develop a more nuanced flavor. Then off to the packing house for quick, efficient processing! I do recognize that some of you might take issue with so-called factory farms and I am not immune to calls for more humane techniques for raising meat. Certainly in the early stages of any anthropophagic operation, there would be no need for intensive systems and we can happily make use of farms with welfare standards like the ones which supply “happy meat” to such grocery giants as Whole Foods. With these standards in place we can rest assured that our meat will be treated with kindness and compassion through every step of the process. I hope that this little article has dispelled any qualms you might have had about anthropophagy and has whetted your appetite for the delicious and nutritious benefits of human-based meat. Keep in mind, the introduction of cannibalism does not have to mean a diminishment in non-human meat consumption. The more meat and animal products (human and non-human) the better, that’s what I say. Just remember, when you sit down to those baby back ribs, say a little prayer and give thanks to the baby who gladly gave them to you.